Delegates at Britain’s Labor Party Conference overwhelmingly passed a motion Sept. 27 challenging a National Health Service contract with the giant German delivery company DHL that takes effect this week. Dave Prentis, general secretary of Unison, Britain’s large public service union, condemned the Labor government’s sell-off of logistical services: “Leave the privatization and failing markets to the Tories. … This is their agenda, not ours.” Unison members simultaneously were carrying out a 24-hour strike against the NHS, the second in recent days. Prentis was chiding Labor ministers for a “dangerous change of direction” and “market madness,” according to the Independent, when his microphone was turned off and the proceedings disrupted. In addition, shop stewards associated with the GMB union voted Sept. 25 to hold a strike vote among 5,000 DHL drivers in response to the company’s wage offer and plans to replace 3,000 of them with contract workers. Shanghai Mayor Chen Liangyu, a top Communist Party of China leader, was suspended from all his posts pending an investigation into an alleged social security scandal. 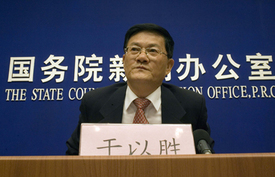 Chen, along with other Shanghai officials, is implicated in a scheme to siphon off money from Shanghai’s social security fund into shaky real estate ventures and road projects. According to a preliminary investigation, Chen was also involved in other violations, such as helping to further the economic interests for illegal entrepreneurs and family members through his official posts, People’s Daily reported. Anglican Archbishop Emeritus Desmond Tutu criticized the current state of affairs in post-apartheid South Africa. In his Steve Biko Memorial lecture at University of Cape Town, Sept. 27, Tutu stressed that the work of Black consciousness — started by anti-apartheid leader Steven Biko — is not finished. “Fundamentally we do not respect one another,” Tutu said. “Perhaps we did not realize just how much apartheid damaged us, so that we seem to have lost our sense of right and wrong,” he said, commenting on the growing crime rates. Tutu also warned against ethnic strife, holding up Rwanda, Burundi, Kenya, the Democratic Republic of Congo, and Bosnia as cautionary examples.